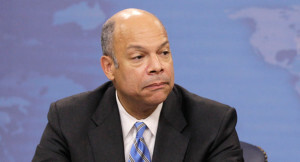 Jeh Johnson, the Secretary of Homeland Security, under pressure from members of Congress, said on Thursday he was currently reviewing the release of immigrants from jail that were illegally in the country, had been convicted of various crimes and were facing deportation. Last year Homeland Security released over 36,000 such immigrants. The undocumented immigrants had been found guilty of crimes, according to data from the federal government. Among that total, 193 were found guilty of homicide and another 425 of sexual assault. Close to all of the immigrants released were and still are facing deportation. All of them are required to check regularly with law enforcement as part of the condition of their release. Johnson spoke to members of the Judiciary Committee of the House on Thursday. He told the committee members that he had asked to receive a deeper understanding of the immigrants’ releases. In a number of cases, said Johnson, the immigrants were given their release under an order handed down by an immigration judge. The release usually included a type of monitoring and supervision. Johnson said he had seen serious convictions on the list including for homicide and he wanted to be assured that everything is being done that should be done. The committee chairman Rep. Bob Goodlatte a Republican from Virginia criticized the White House policies saying the immigrants released endangered the lives of Americans needlessly. Since 2011, White House officials have tried to focus immigration officials on deporting the immigrants that recently crossed the border, repeat violators of immigrations laws and people posing a threat to the safety of the public. In March, President Obama asked Secretary Johnson to review the deportation policies of the department to see if the expulsions could be carried out in a way that was more humane. This week officials in the Obama administration asked Johnson to not announce those results of his review until sometime in August as to avoid angering Republicans in the House who are contemplating a number of bills on the overhaul of immigration. Johnson on Thursday told lawmakers that he thought it necessary to clarify the instructions given to officers in immigration about who should take priority for being deported.